In my recent web-browsing, I’ve come across some garden advice that made me stop, blink, and yell loudly at my screen, “No, you idiot, that’s not true!” Since I didn’t want to be the only one yelling at my computer screen, I thought I’d share some of this sage advice with you, along with what I think about it. Besides, we’re all idiots until we learn better! If you live in a place where the soil pH is low (acidic), go ahead and add eggshells to your compost pile. They’re mostly calcium, and they will raise the pH for the same reason lime does. However, if you live in an arid part of the country (like most of Colorado), adding eggshells is not a good idea. Most garden plants prefer a soil that is just shy of neutral (6.5 or so). Our pH tends to be much higher—8 or more. Also, our soils are already mostly calcium (hence the high pH). At best, adding eggshells will only add more calcium to our calcium. At worst, they’ll raise the pH even higher, the last thing we want. 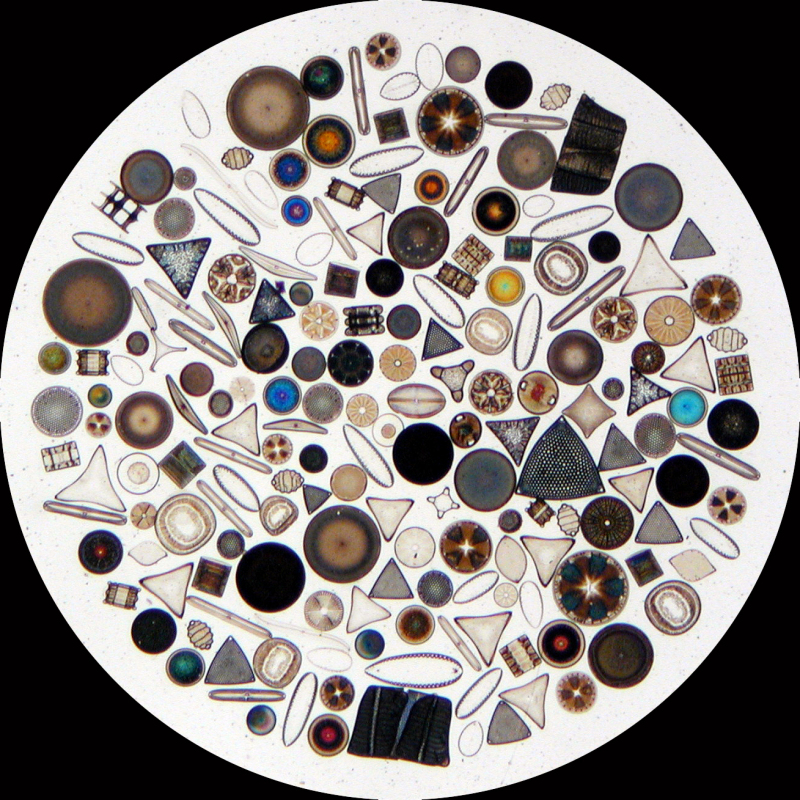 I’ve never seen eggshells equated with diatomaceous earth, but just in case this is a widespread belief, I’d like to clarify that diatomaceous earth is composed of the silica exoskeletons of single-celled marine plants called diatoms (see magnified diatoms at right). It has nothing to do with eggshells. It is true that bugs don’t “like” it, however. The spines on the diatoms jam up the arthropods’ “armor” and render them immobile. Put rocks in the bottom of your pots for drainage. No, do not put rocks in your pots, unless you want to make them heavier and harder to lift. Rocks take up room that the plants need for their roots. They do not improve drainage. The water will drain out the hole in the bottom of the pot just as readily, rocks or no rocks. If you have a drainage issue, perhaps you need to renew the potting soil. And yes, you absolutely need a drainage hole. If the potting mix washes out, cover it with a piece of mesh or a piece of broken flower pot, concave side down. If your pot is much deeper than needed for the plant roots, try filling the bottom with Styrofoam egg cartons or packing peanuts (not the ones that disintegrate in water). If you use the peanuts, bag them first so you don’t have a mess when you go to dump out the pot. Note that the point here is to save on potting mix that will never be used by the plants, not to improve drainage. Put a disposable diaper in the bottom of your containers to act as a water reservoir. I know that diapers have this cool gel stuff in them that manages to soak up tons of water, so the concept makes sense. However, I don’t want all that extra plastic blocking the roots of my plants and interfering with drainage. Happily, there’s no reason to buy a pack of Huggies just to get the gel. 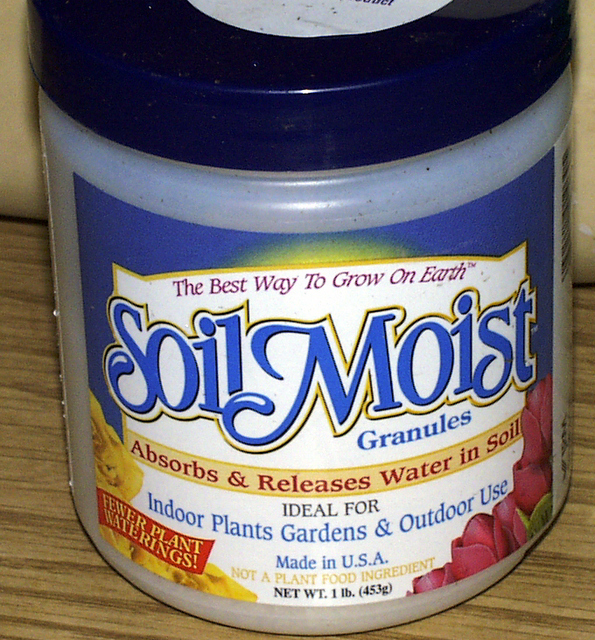 That same water-holding material is available in a little jar, specifically meant to be added to potting soil. Even better, many brands of potting soil come with the gel already added! You should know that it doesn’t last forever; two seasons is about max and then it breaks down. Since you shouldn’t use potting soil for more than two or three seasons anyway (it too breaks down, becoming compacted and unable to hold air and water), this isn’t a problem. And by the way, when I refill my deck pots with new potting mix, I dump the old stuff into the compost pile. Why waste all that peat moss? Well, there you go. Three garden myths debunked. I’ll be sure to add more as I run across them; call me the Snopes of the horticultural world. If you hear any garden advice you’re not too sure about, or even if you’re wondering about advice you’ve faithfully followed for years, bring it to my attention and I’ll address it in future posts.